A Knife for life! These are the best Knives on the market today and that why we sell them! British made brilliance. 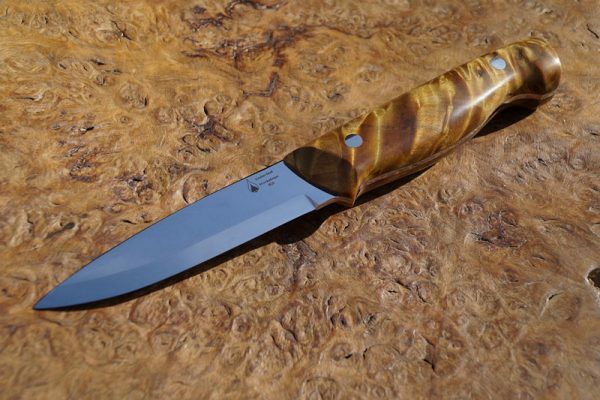 This Adra v1 hunting and fieldcraft knife is made in AEB-L stainless tool steel handled in stabilized gold poplar fixed with stainless steel corby rivets. Emberleaf knives are hand-crafted from start to finish, with every single detail made with great care by our passionate bladesmiths. The exceptional quality of our knives is a result of our seamless integration of natural materials and state of the art alloys. With our experience and skill of making blades, our smiths can restore almost any tool with a cutting edge to the highest of standards, making your tools seem like new.